With his unmistakable color, shape, and form, Henri Matisse’s art contributed to the revolution in the development of painting and sculpture during the opening decades of the 20th century. Along with Pablo Picasso and Marcel Duchamp, his work radicalized the rules of representation in the plastic arts. Matisse was a French draughtsman, sculptor, lithographer, and most notably a painter, whose work belongs to numerous movements, particularly expressionism and fauvism. Matisse’s paintings, while conventional in subject matter - often depicting nudes, portraits, landscapes, and oriental scenes popular at the the time - still remain shocking for their use of pattern, color, and line. His artworks are often painted in bright, expressive color with disdain for traditional notions of verisimilitude. In particular he is known for his striking blues, periwinkle purples, and rich, golden yellows. Lines of figures are lyrical and loose, forming a wild yet balanced composition, like a well composed piece of music; a vital harmony. 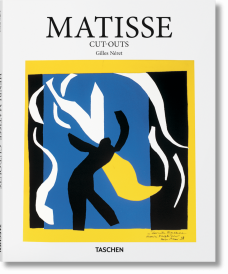 TASCHEN books explore Henri Matisse’s art and biography in a Basic Art Series title as well as a book dedicated to his cut outs or gouaches découpées. 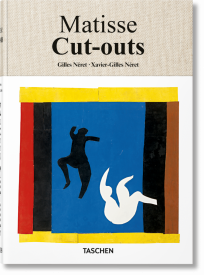 After serious surgery following cancer later in his life, Matisse was unable to wield a brush like he once could and developed a new practice centered around a collage technique using paper cut outs. This new art, ‘drawing with scissors,’ as he called it, produced a remarkable body of work, including the seminal piece The Snail, and an artist’s book collection of cutout prints called Jazz. TASCHEN offers a poster set publication as well as a detailed monograph on this period of his work. Perhaps the artist’s finest achievement though, and a perfect example of a gesamtkunstwerk, is his Chapelle du Rosaire, a chapel on the French Riveria he designed from the interior out. 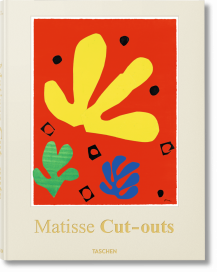 Like his gift to the Dominican sisters of Vence, Matisse’s entire oeuvre is a colorful, expressionist, and undeniably great contribution to modern art.